The Slate-colored Coot or Andean Coot (Fulica ardesiaca) is a South American rail that is endemic to north-west Argentina, Bolivia, northern Chile, Colombia, Ecuador and Peru. It is found mainly at elevations between 2,100 meters (6,900 feet) and 4,700 meters (15 420 feet), but it is occasionally seen along the coast in Peru and northern Chile. It inhabits swamps, freshwater lakes and ponds. 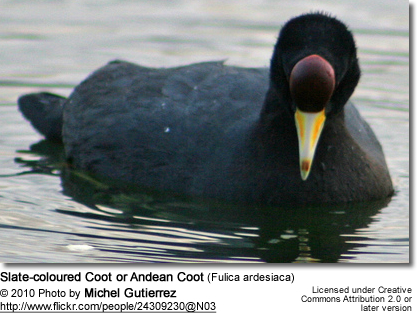 It is a reasonably large coot with a mostly blackish plumage and a slightly darker head. It has a small dark red frontal shield and a yellow bill with a grey tip.